We chosen to do this mainly because winter is so bleak. Laurel once said, “If you leave those lights up in the darkest part of winter, I’ll write a letter to the paper explaining why we leave them on.” People like me don’t need additional reasons to NOT take down the lights. Weather, squirrels, and the fragility of twinkle lights reduce their life span to a disappointing 1-3 years. Last season, the chandelier lost a string and it was time to relight it, so when I opened the box marked 100 Solar LED lights (75% off) I found I had made a significant mistake. There was no plug, but four feet from the first bulb was a solar panel which measured about 4”x6”. 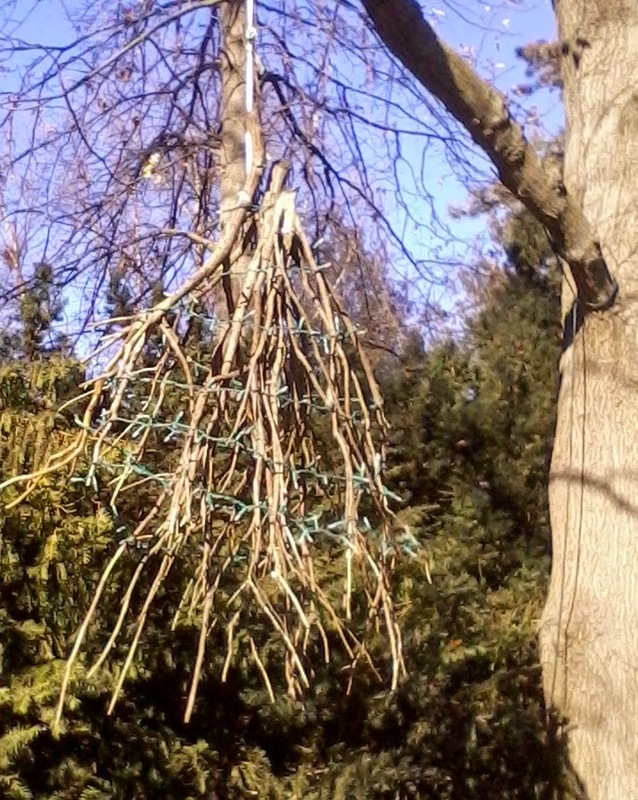 This was not the right product to suspend from a tree hoping that the sun would mostly hit the array. Happily, we do have a garden arch between the driveway and front door that is about 60% covered with bittersweet and the solar string would be perfect for there. 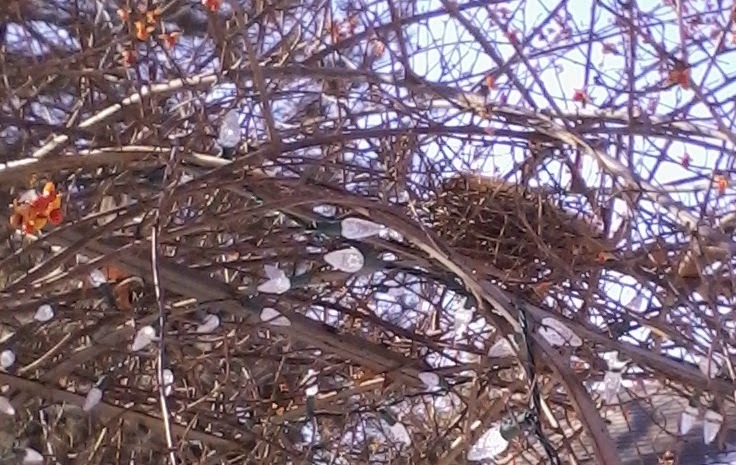 Look at the picture carefully and you’ll be able to see the installed lights, the bittersweet, and a bird nest. If you squint at the top of the nest there’s a trace of yellow, which is an ear of field corn I found in the nest while working on the lights. Yes, actual field corn - the hard stuff that the garden stores sell to people who fabricate harvest decorations, or heaven forbid, feed squirrels. The public events of these days are being hard for me. It’s difficult to feel hopeful about government’s ability to serve us all. Policing practices are dividing us. Religion is being misused to terrorize people. We can’t agree on science. We can’t agree on how to care for our world. I find hope in that impossible ear of corn. What are the possible explanations about how it got there? Raccoon? – we have them, but I think raccoons are not savers for later. Opossum? – we see them too, awkward climb for an opossum. Prankster? – why bother? Squirrel? – probably, but I am switching to an alternative answer that makes sense for my need - Angel of God. An angel was sent to deliver a bit of mystery and surprise. We Christians occasionally explain our beliefs in this very way. Why wouldn’t God send Clarence Odvody (see It’s a Wonderful Life) to help me see that things are better than the way my foul mood distorts them. Why wouldn’t God distract me with an extraordinary moment of daily life to put daily life in perspective? Aren’t we all called to treasure the small delights and surprises? I absolutely agree that God tweaks our existence with the unexpected, that can bring a smile and a "Thank you, God" to moments when we've only seen same-old, same-old grey. THANKS, TOM.